Police Departments, Utility Companies, Municipalities Upfitters, etc. Don't Get Stuck Get STARTED! PriorityStart! ProMax H.D. 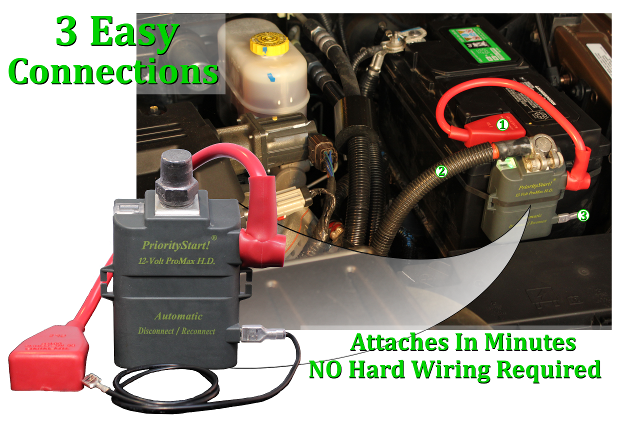 is a Totally Automatic, heavy duty, computerized disconnect system that protects your budget by saving the vehicle starting power, the battery and the alternator, fuel and more. Used by major fleet installers worldwide. This 45 second video shows how Fleets Save With PriorityStart! Save time and money PrioityStart! Don't let radios, computers, lights, cameras, GPS, MDT and other devices kill your batteries. 12 and 24 volt versions of the PriorityStart! ProMax H.D. are available through our Spokane Washington based headquarters or through our worldwide distributors. With our Engine Run Feature, the PriorityStart! can sense your vehicle is running, and will not disconnect. When your vehicle is off, your equipment is draining the battery, PriorityStart! will monitor and isolate the equipment from draning the battery to a no start situation, protecting your battery, alternator, and equipment. Learn how other Fleets are not only saving their batteries, but saving fuel at the same time with PriorityStart!